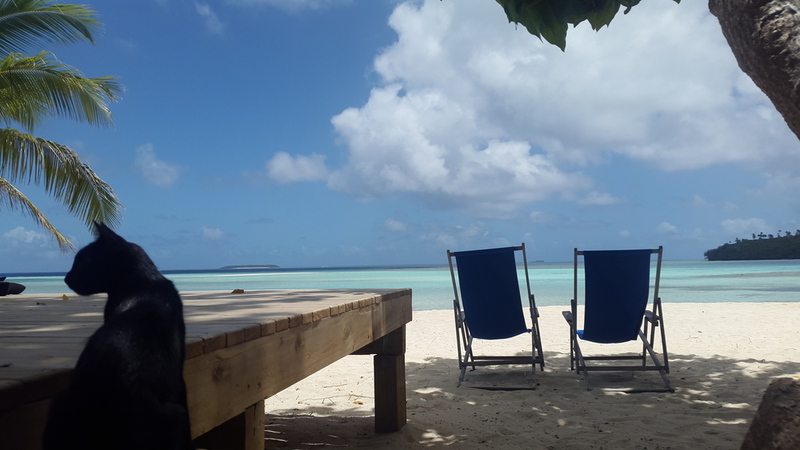 Things are winding down here in Vava’u. The whales have moved south and with them have gone most of the tourists. We, on the other hand, are still here. Plans change often for us, in small ways and large. In fact, it’s abnormal if our plans don’t change at this point. Over the past year there have been times when we’ve had to leave suddenly, pulling anchor in the early hours of the morning and reevaluating our next move only once we’re underway. We’ve made and broken loose plans with several friends, unable to lock down a date or place to have them on board, and as their week of vacation time draws closer and closer and logistics have still not been sorted, those plans fizzle out and we start looking at other options months down the line. We’ve had to skip entire countries, weather or timing not permitting us to follow our original route. It can be pretty annoying and bums us out when it means missed opportunities to see friends and family. But it also means that we may find ourselves in a place we never intended to visit, like Niue, or that we end up staying for a while in one place and really get to know it, like Makemo in the Tuamotus, and now, Vava’u. In this case, our change of plans has surprised us. We’re so happy we’ve stayed in Tonga rather than hurrying off to pack in a quick couple of weeks in Fiji. It was a bit of a disconcerting start here with constant rain and wind and the ever-present throng of boats packed into Neiafu, Vava’u’s main harbor. But as the weeks went by the weather improved and we began to realize that most of those boats never leave the harbor. Which means we’ve had some incredible anchorages all to ourselves. 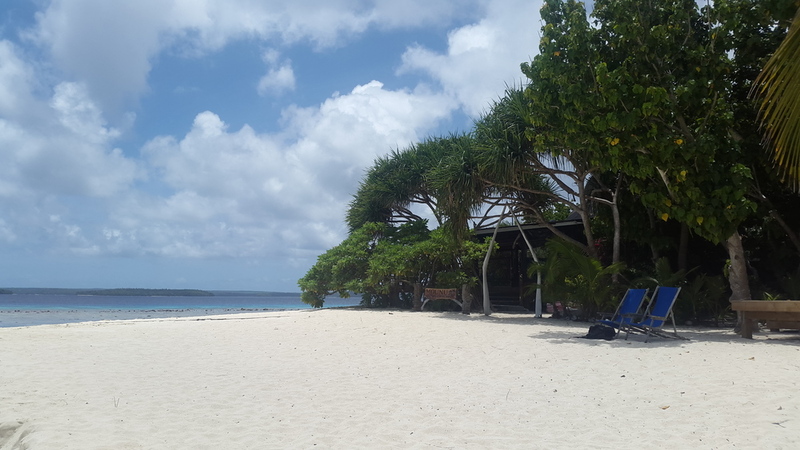 We’ve also unexpectedly gained a more authentic experience here and, having met lots of different people who call Vava’u home, have had small glimpses of what Tongan life is like from the perspective of locals. 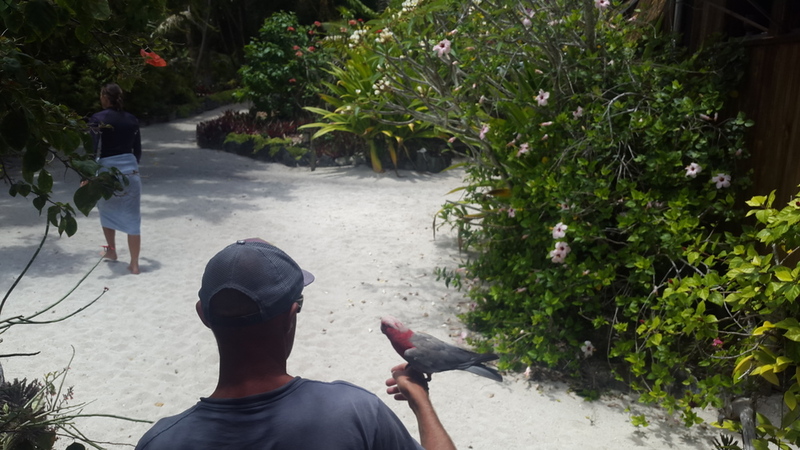 We've had pig roasts and Tongan feasts, traded fish for fresh produce in one of the smaller villages, and learned about some of the traditional arts, ways of cooking, native species, and even early navigation tactics. It's not the first time we've felt lucky to have been able to be more than just tourists. The middle of October is the beginning of the end of the season in Vava’u, and now the whole place has that empty but still animated feel. Things feel calmer. More quiet. Maybe it’s just my Northern hemisphere sensibility kicking in as November arrives, but it feels a bit like it does at home when fall settles in. One season lingers as long as it can until it is fully eclipsed by the overpowering presence of the next. It’s in this climate that Matt and I have been spending lots of time out on the porch at Mounu Island, where we’ve become good friends with Kirsty, Allan, Lynn, Amber and her three adorable children, Ma'ata, Nati and the rest of the wonderful staff there, and the family pets: Otto the dog, Chicken and Charcoal the cats, and Brad the bat. Guests or no guests, it’s my favorite spot to get off the boat. What I love most is spending the late afternoon sitting around the long wooden table having a coffee or sipping on a beer with whoever’s around. The sound of the waves lapping at the sandy shore, the sight of the boat out on the mooring, the dog at your feet, the baitfish schooling up just offshore… Replace the coconut palms with ash trees and the chirping geckos with mourning doves and I’m back home. It’s the first time on this trip that I’ve missed home not because everything is so foreign but because everything is so strangely familiar. We’re off in a few hours for the Ha’apai Group, a 70 mile overnight passage, so we won’t be popping into Mounu until next year. Which brings me to our biggest change of plans yet. Next year... We’ve decided not to make Australia our final destination in December. Instead we'll spend cyclone season in New Zealand and circle back East for another lap of the South Pacific next year. 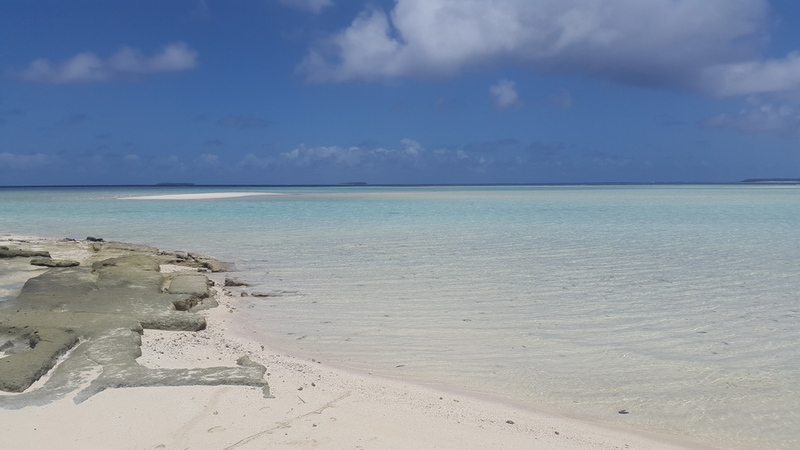 There has been so much we’ve had to skip over and we’ve really only scratched the surface with our six month stint sailing between French Polynesia and Tonga. It’s a fitting time to announce this, too, because today marks the one year anniversary of the beginning of the trip. Hard to believe that only one year ago we were sailing out of Narragansett Bay on a calm, crisp morning, full of anticipation and eagerness. Harder still to have imagined that we’d have been to all of the incredible places we’ve been to, met the number of people we’ve met, and discovered things to be marveled at and adventures to be had everywhere we’ve gone. It’s gone by in a flash and we’re thrilled to be able to continue on for another year. In the meantime, we're celebrating Year One - where else? - at sea. Only a few more passages until we reach Opua, on the northern coast of New Zealand's North Island. Matt's enthusiasm level has dropped slightly in the past week after Australia lost the Rugby World Cup final to the Kiwis... But I'm pretty anxious to get there, where I'll be feasting on blueberries, sweet corn, oysters, cold water fish, good cheese, and crusty bread and washing it all down with (finally!) a nice glass of wine. Yew! Looks like my attempts to update the blog more regularly have failed… We’ve had a pretty action-packed three weeks so I haven’t spent much time chasing internet access and when I can get online, uploading photos has been nearly impossible. I am able to upload small photos to Instagram fairly frequently, though, so if you don’t already you can follow along here. Since I last wrote, the rain finally lifted (though not before completely filling our tanks!) 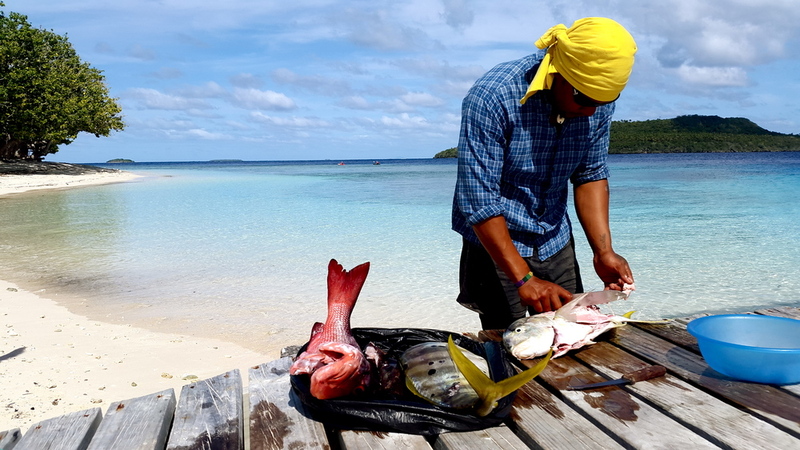 and we’ve been exploring as much of Tonga’s Vava’u group as possible. Being in town is convenient, but the mooring field is crowded and your only hope of getting internet access is at one of the restaurants, nearly all owned by ex-pats, where you can generally choose from french fries, pizza, or fajitas. On the upside, they do broadcast American football and Rugby World Cup matches. So after a brief greasy-food-eating sports-watching blowout, we stocked up on fresh fruit and veggies and headed out of town. As we sailed out of the harbor that first day with the sun finally illuminating Tonga’s marvelously clear water, I suddenly got why there are so many sailboats here. The geography of the Vava’u group is such that there are dozens of well protected anchorages - deep coves, enclosed lagoons, sweeping reefs - scattered among open bays and channels where the wind funnels through but the swell cannot reach. Good sailing by day, secure holding at night. You feel so remote but town is just a few miles away. Between anchorages, we often find ourselves skating across flat water with just a bit of the jib out, able to comfortably enjoy nice lunches, make coffee without spilling, and reel in fish without fear of falling overboard. Sailing is simple and relaxing again! After so much time on the open ocean worrying about wind and sail changes, waves and weather, it’s such a pleasure to go for an impromptu jaunt down to another island or head out for a few hours of diving. We’ve caught up on sleep and boat maintenance and our freezer is filled with fish again. Life feels a bit more regular. It hasn’t been dull, though. Matt’s brother Glenn and his girlfriend Amy have been here for the past week. We’ve been diving in caves filled with thousands of glimmering baitfish, tramping around lonely islands on the hunt for coconuts, catching yellowfin(! ), eating grilled squid (!! 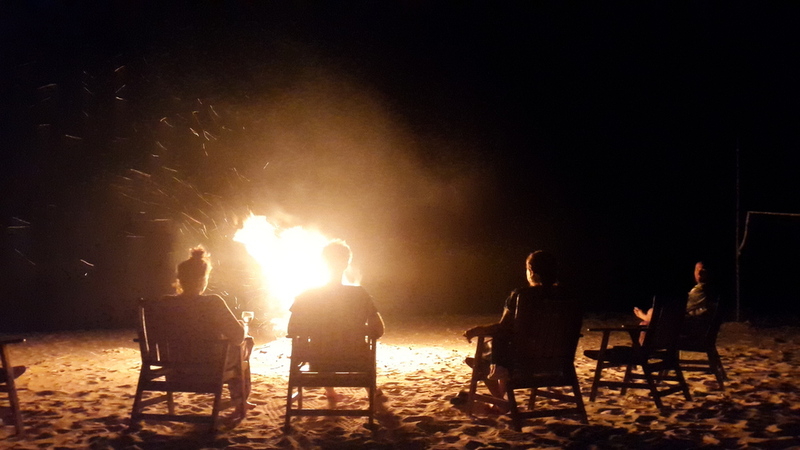 - Glenn’s first victim), and spending many of our nights cooking over beach fires with friends on uninhabited islands. I know. Pretty ideal. Just enough room for three of us behind the reef. We’ve also enjoyed a couple more refined meals, one at Mounu Island Resort and the other at Eue-iki’s Treasure Island Resort. These are both “eco-resorts”, not air-conditioned, multi-story, manicured hotel resorts. We met the owners of Mounu, Alan and Lynn, through friends of ours. Their daughter Kirsty, who helps run the place, is a mean kite surfer and a fantastic cook. Their guests are always happy and well fed. Spending time there feels like hanging at a friend’s place and we always look forward to watching the moon rise on their beach-front deck while Alan tells stories about whales, fishing New Zealand’s far north, and whatever else is on his mind that night. Usually the general theme is danger: at-sea rescues, shark attacks, Vladimir Putin… standard dinner party stuff. Eue’iki (aka Treasure Island) is where we met up with our friend Joe to complete a course in free diving. Like all of the islands here, Eue’iki’s coast drops off to over 40 meters just a stone’s throw from shore. This is an ideal environment for learning the basics of free diving. We practiced relaxation and breath holds in the shallow area and diving technique and static depth training - essentially holding your breath at a set depth - out in the deeper water. Treasure Island has a covered dock where we learned freedive-specific stretches and went through a few yoga courses with Heidy, who is a fantastic teacher and has become a good friend. (I think the thought of spearing a fish at 20 meters is about the only thing that could get Matt to do downward dog.) The four of us sailed to a favorite spot of ours, Hunga, which is a deep, flat lagoon almost entirely surrounded by tall hills. Just outside the narrow pass we dive in what feels like an aquarium: busy striped jacks darting around like they have places to be, thousands of tiny yellow and black fish appearing like a swarm of bees but pecking like birds at the algae on the reef, the occasional job fish poking around, a huge blacktip reef shark making the rounds now and then, and a school of ghostly, big eyed mumus dangling, as Joe describes them, like marionettes staring out at you until you make eye contact, when they just as silently turn and disappear. Because we love to fish and therefore often find ourselves with more than two people can eat, we worked out a deal with Kirsty at Mounu and Mark and Veronica, the lovely owners of Treasure Island. They’d take any fish we’d caught or speared and didn’t have space for in the freezer off our hands. They’d get to serve fresh fish, we’d get to fish as much as we liked, and I got to learn new ways of preparing whatever we caught. Between Tamata, Mounu and Treasure Island, there were fish recipes from Mexico, Tonga, New Zealand, the States, and Australia. Plus those we’d all learned along the way . Typically after we’d had a significant froth session over hauling in a tuna off the line or a fresh bucketful of jacks, snappers, and jobfish speared off the reef, we’d spend the next half hour talking about what we were going to do with it. 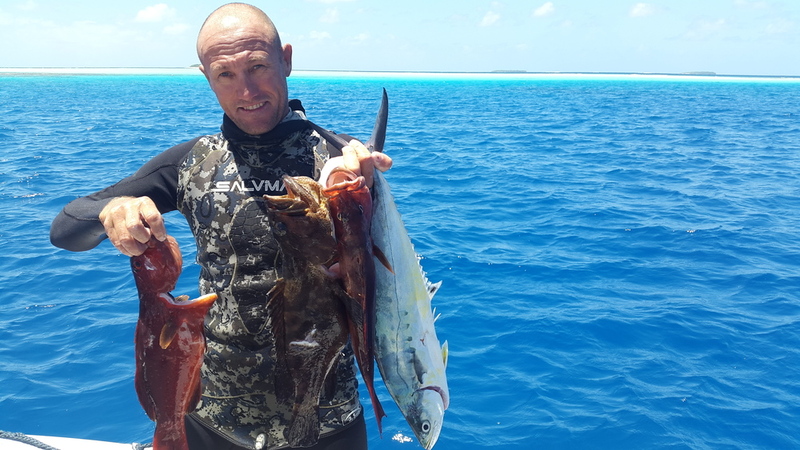 Options for eating it raw ranged from sashimi, poke, carpaccio, ceviche, and poisson cru, known simply as raw fish in Tonga. Or maybe we’d sear it for just a minute and serve it with a freshly whipped aioli. We could roast it whole, stuffed with herbs and garlic. We could sort of “cure” it in a oniony-tomatoey-vinegary mixture (escabeche). We could fry it up and serve it with chips. We could chop it up and cook it into a curry. We could mix up a quick coconut milk sauce and let the rich, sweetness of the fruit play against the bright, saltiness of the fish. And after filleting, we could heat the head, wings, and bones into a simple broth, add a few veggies and herbs and make a clean, spicy soup. And we could add noodles or rice or sausage or cream if we felt like something more substantial. Whether slicing it up thin and letting it melt in your mouth after a long day of diving, having it served to you at a long table with good conversation and good wine, or whacking it on a campfire whole under the stars, eating a fish that you’ve caught yourself just hours before is one of the most basic and most enjoyable culinary pleasures there is. I could go on and on about fish. Instead I’ll just say thanks to Glenn for digging out and transporting Matt’s legendary Western Australian lure, a red and white “Giant Trembler”, because that’s been the favorite among yellowfin. More than a few jokes have been made about its name (all very tasteful, of course) but it’s undeniable - fish are crazy for that thing! We’re off to see what we can get with it today. Meanwhile, here are a few photos of what we've caught lately. More on Treasure Island, Mounu, whale swimming, outriggers, and underwater caves soon!